After receiving your course form, we shall go for further process of course i.e.ï¿½ Arrangement of class for Regular / sending of books / study material & instrument for Correspondence / sending of study material by email for Internet. If any deposit the cash or cheque for 'Acupressure Research Training & Treatment Instituteï¿½ in Axis bank Account No.ï¿½057010100177573ï¿½then bank charge will not be deducted. 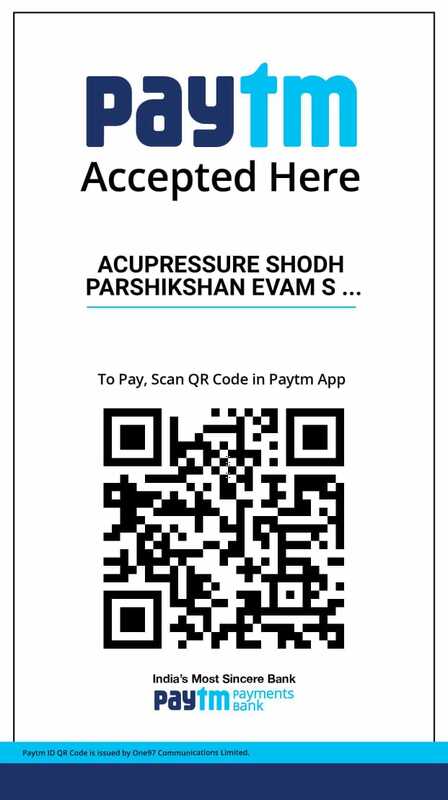 If any deposit the cash or cheque for 'Acupressure Shodh Parshikshan Evam Shikshan Sansthan IFSC SBIN0011602ï¿½ in SBI Account No.ï¿½38030941780ï¿½then bank charge will not be deducted.